I am pleased to report that our group of study abroad students, led by Associate Professor Jen Pepper, arrived in the United Kingdom (Canterbury, England) on schedule on Sunday morning, September 14. I am sure after settling into their new living arrangements at Canterbury Christ Church University, our students will immediately immerse themselves in a unique and rewarding international experience. All of us at Cazenovia College wish the following students a productive, memorable and enlightening study abroad experience. Our students are about to enjoy a cross-cultural experience, be fully integrated into the Canterbury Christ Church University curriculum and residence life programs. They will live in University housing together with British students and students from British Commonwealth nations. 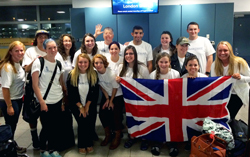 These Cazenovia students will truly be attending a British institution, not an American institution located in England. To our students ... as you expand your understanding of the global community through participation in the British system of higher education as well as through accompanying social and cultural experiences, we look forward to your return in December and the new perspectives you will bring back to campus as experienced international students.